Aviation Updates Philippines - The national flag carrier, Philippine Airlines will commence its flights to the city of Doha, Qatar starting this 28th of March, 2016. "PAL continues to grow its routes in the Middle East by opening a new route to Doha in Qatar. Our overseas Filipino workers in Qatar can now enjoy that distinct Filipino service that will bring them much closer to home," Philippine Airlines President, Jaime Bautista said in a statement. Philippine Airlines will be flying to Qatar's capital city five times weekly (on Monday, Tuesday, Thursday, Friday, and Saturday). The launch will enable 200,000 overseas Filipino workers in Qatar to fly seamlessly to the Philippines with the Heart of the Filipino. "Likewise, Qataris can now enjoy an easy route to discover the wonders of the Philippines and Philippine Airlines through convenient connections to any of PAL’s 30 domestic and 43 international destinations," he said. 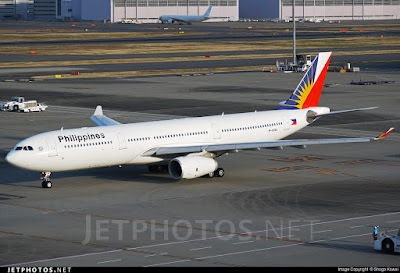 The flag carrier will use its Airbus A330-300 aircraft for the route. The aircraft is fitted with 39 premium economy seats and 375 economy seats, 414 seats in total. The airline currently operates 15 Airbus A330 aircraft. Passengers may also enjoy Philippine Airlines free WiFi, available for 30 minutes together with 15 mb of video streaming using the passengers' personal devices through the app myPAL player, which can be downloaded through iTunes or Play Store. According to Rappler.com, "the inaugural flight will be marked with a formal dinner-reception on March 29 at the Sharq Village and Spa in Doha, with PAL executives, Qatari officials, travel agents, tour operators, and local media." Competition will grow on the Doha to Manila sector with the entrance of Philippine Airlines. Qatar Airways, Qatar's largest airline, is flying to Manila fourteen flights weekly, while low-cost carrier Cebu Pacific Air flies two times weekly to Manila.